It's alright, I'm an officer. 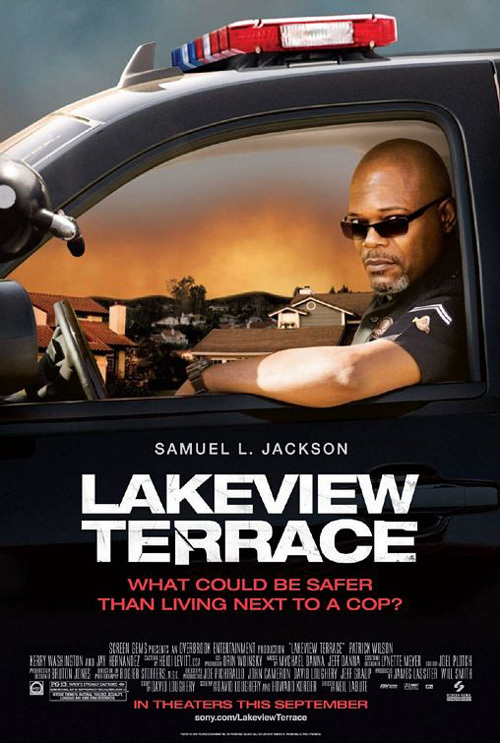 Don't live next door to Sam "motherfucking L" Jackson. Particularly if he's playing a racist cop. The first two-thirds of this are highly effective and, as you'd expect from Neil La Bute, the male pysches involved are well-observed. Mixed-race couple Kerry Washington and Patrick Wilson (who must play William Hurt's son at some point; he's a ringer him in the '80s) move next door to Sam and meet with his instant disapprobation. And things get worse. It's more effective than the likes of Pacific Heights or Single White Female because Jackson is really scary when he's in a bad mood, as he is for much of this film. La Bute makes him a single parent, and also makes Wilson something of an arrogant prick, so while you're never in doubt that Jackson's views are unsound and that he's got it in for the couple, you're also aware that their getting it on in their pool (in sight of Jackson's kids) isn't the best way to react to frosty neighbour relations. The playing of the race aspect is intelligently done for the most part (although the eventual explanation for Jackson's views is just trite - far better to leave it undefined). However, the last third of the film goes into full-on psycho-on-the-loose territory with fights and shootings to the max. Which is still entertaining, but it's also dumb - something the previous hour or so of unsettling dread mostly wasn't.